Bringing family and friends to the table and sharing food is what separates us from other life forms; it creates bonds, feelings of love and acceptance. 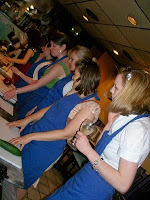 To aid in the ritual of creating meals and breaking bread, I have put together an updated list of cooking and baking classes in the Baltimore and surrounding areas. This time I have set them up by area: Baltimore City, Baltimore County, Howard County and Anne Arundel County. If you know of other classes being offered in the area please share and I will update this list.